I have spent way too much time staring at a computer screen running Max/MSP. 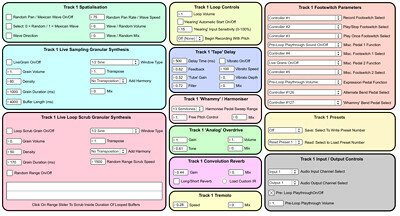 Programming in Max was the main focus of my studies for my Mmus in Music Technology & Computer Music (University of Leeds), as well as my BA in Music Technology (Bowling Green State University). 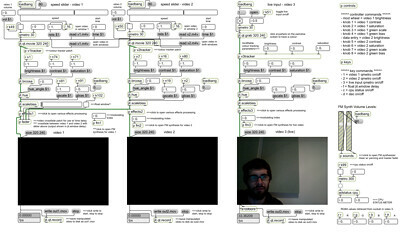 Max/MSP also helped me form the foundation of my recent gig, ‘Sonic Cauldron’, in April 2013 at Left Bank, Leeds. Here, four live musicians playing multiple inputs ran through 16 analog inputs on two Focusrite Saffire Pro 40 interfaces. Sounds were processed, spatialized, and distributed from within the patch to 10 loudspeakers (an 8 channel array surrounding the audience, and 2 on-stage monitors). If you are looking for custom-designed purpose-specific and/or site-specific work, I am available for consultation and Max/MSP patch building. Get in touch with any questions you may have.